Then I went to this. Don't get me wrong. I am happy to be living here in the little blue cottage by the sea. But. I. Can't. Make. Art. On. This. Table. Look at how small it is..I don't even want to give the measurements and embarass it! I have tried..but I just can't get 'into it' on this table. 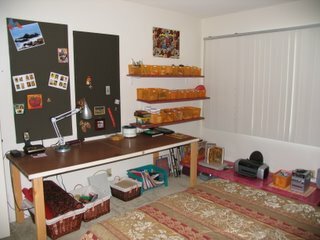 I thought it would work when I ran to IKEA and bought the table top and legs and quickly assembled it when we moved in. It's a nice little table. To have tea on ..or something. Not to use as a studio table. 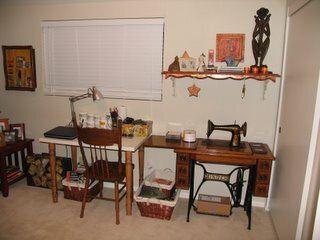 So, I have decided the heck with how it looks in my bedroom/studio...and bring that good old handmade door-table out of the garage and in here. I really think this will help me with my Artist's Block that I am suffering from. If I can move tomorrow after taking everything that is now sitting on the table off the table and disassembling it (so I can fit it through the door) and putting it back together I will take a photo and blog it. Or not.